In celebrating World Monopoly Day on 19 March (yes it’s a thing!) – I thought I will share 10 fun facts about the world’s favorite family game brand, which has over a thousand variations and is enjoyed by more than 1 billion players in 114 countries across the globe. 1. Charles Darrow developed the MONOPOLY game in 1933, using small items from around the home, including pennies or buttons, to allow players to track their journey around the game board. 2. Darrow’s young niece had a better idea and suggested using charms, like the ones on her bracelet, to serve as the iconic tokens fans know and love today. 3. The original tokens represented familiar items from 1930s America, including an iron, purse, lantern, race car, thimble, shoe, top hat, battleship, cannon, and rocking horse. 5. 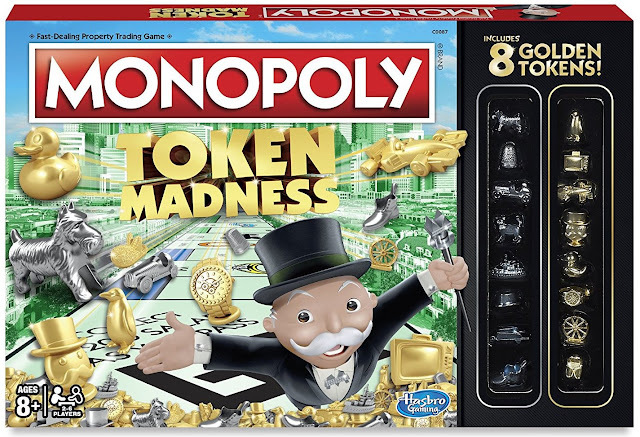 In 1943, when faced with a metal shortage during World War II, wooden tokens were substituted until 1945, when the metal tokens were brought back into the game. 6. The sack of money token was added in 1999 but retired less than a decade later. 7. In 2008 Mr. Monopoly began wearing an M-shaped silver metallic bowtie. 8. 2013 saw Mr. Monopoly ranked #12 on the Forbes Fictional 15 list of wealthiest characters, with a net worth of $1.2 Billion. 9. In 2015 Mr. Monopoly celebrated his 80th birthday by ringing the closing bell at the NASDAQ. 10. Last year Hasbro held a historic vote allowing fans to pick the eight tokens that would feature going forward. Over 4.3 million fans voted to secure spots for the: Scottie Dog; T-Rex; Top Hat, Car, Rubber Ducky, Cat, Penguin and Battleship token on board! Enjoy this World Monopoly Day by becoming part of the Monopoly community and buy, trade and sell-the Monopoly way! Make your own memories and celebrate the evolution of the iconic Monopoly tokens with the Hasbro Monopoly Token Madness board game which is making its way to the nearest store near YOU!